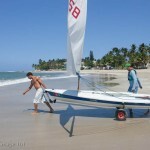 Sailing in Cabarete, is a truly rewarding experience. A typical day will begin with a light Easterly. From noon onwards, it builds till about 4:00pm, then levels off and remains until well after sundown. Average wind velocity in the afternoon is 14 to 18 knots. The temperature on the northern coast of the Dominican Republic varies little. Throughout the year, lows average just below 70F (20C) while the highs hover around 85F (30C). The waters of Cabarete Bay and the ocean within the training area are consistently above 75F ( 24C). 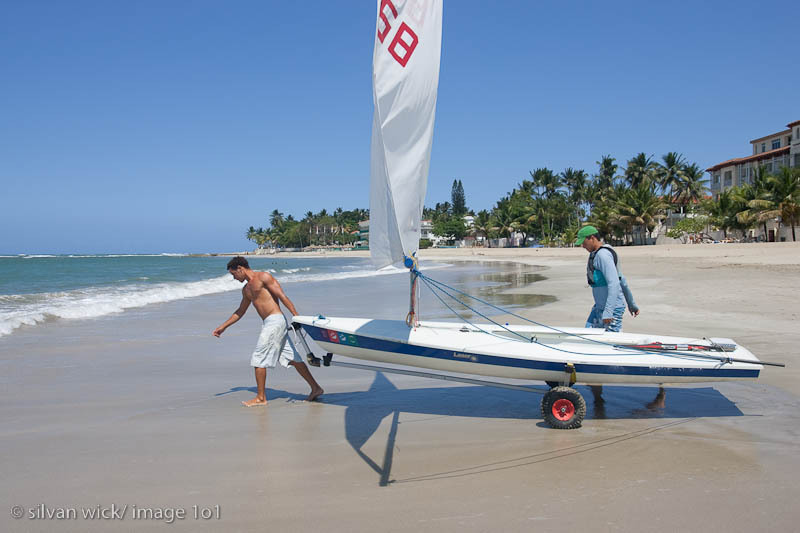 Cabarete Bay itself is unique for the ability of sailors to choose their training conditions. Within Cabarete Bay, the sea state is flatter than on the ocean side of the reef protecting it. Inside, the winds are lighter and shifty. Morning training inside the bay, is much like any light air, flat water venue while outside swell and chop can make your light air sailing very challenging. In the afternoon when the winds come up, the best sailing is outside with ocean swells and the providing some of the most thrilling sailing surfing conditions in the world.